Back in February I read an article in the Kansas City Star about an organization that was providing birthday parties to children in Kansas City, Kansas whose families were struggling to make ends meet. Interestingly one of the two founders used to be a school psychologist in KCK while I was teaching there. We never had a school in common but I knew of her and I’m sure we crossed paths at workshops and inservices. 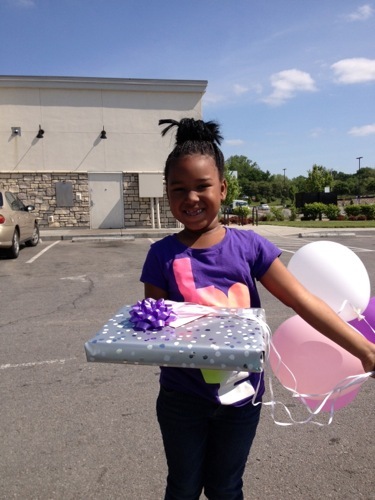 Volunteers provide balloons, a home-made birthday cake, and a gift for children from 1 to 12 years of age. You can read more about how they got started here. I understand that they are branching out into North KC and Kansas City, Missouri. 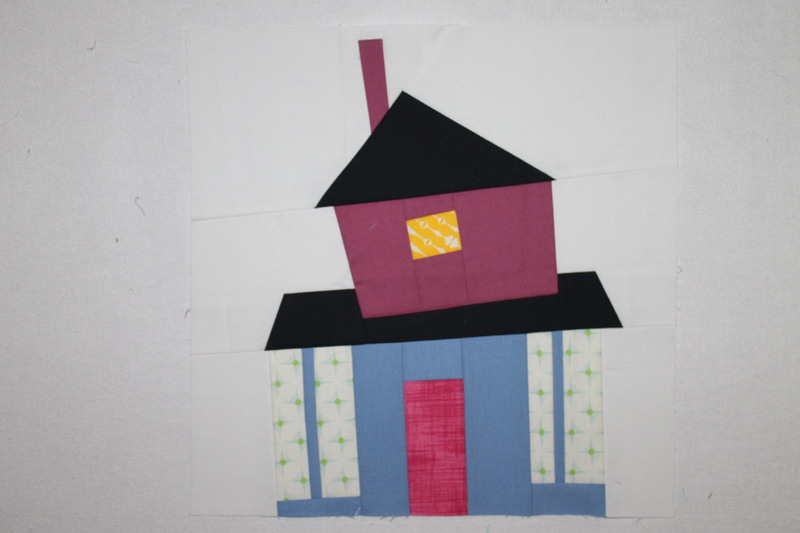 I quickly signed up and after picking out and delivering my first gift I began to think about making quilts for the kids and how that might work. 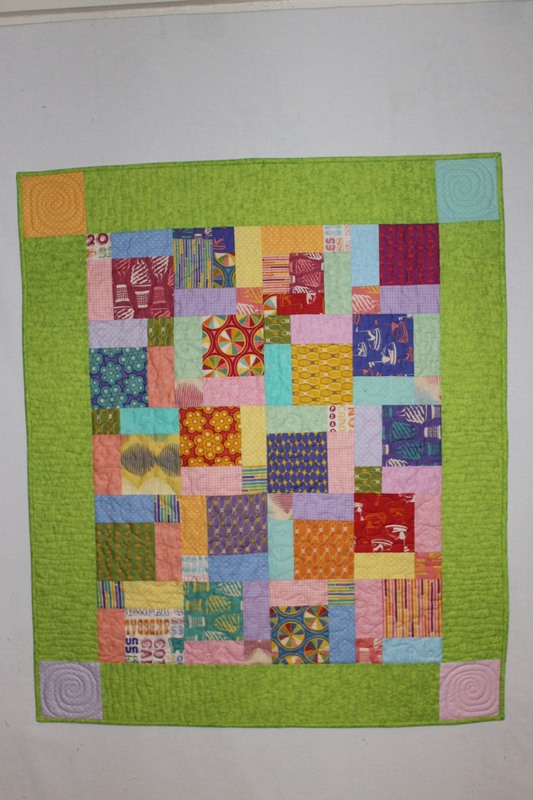 Before going any further I e-mailed Jill to see if this was something they would even want and she said “Sure!” Then I talked to some of my sewing friends and KCMQG members and the next month I received nine small quilts to donate! I wish I had taken pictures of them all but I only have the ones I have stitched up so far. 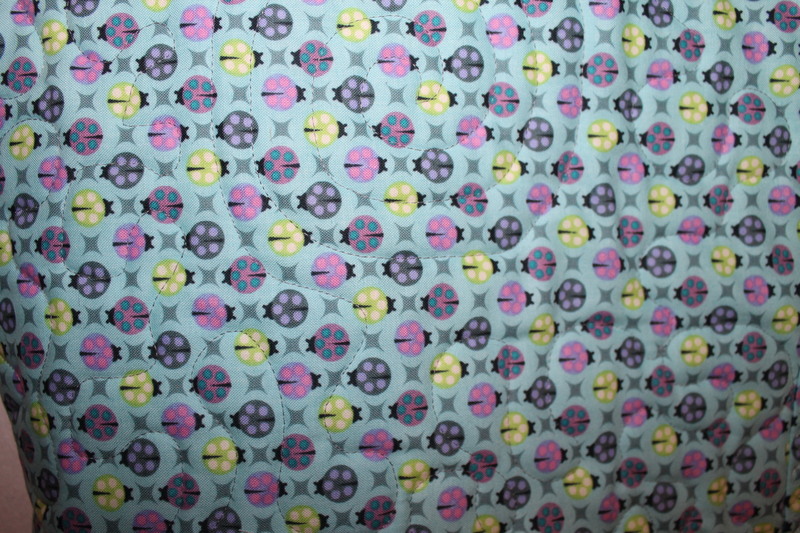 This first one is from Hyacinth Designs called Garden Fence using Tula Pink’s Birds and Bees fabric. 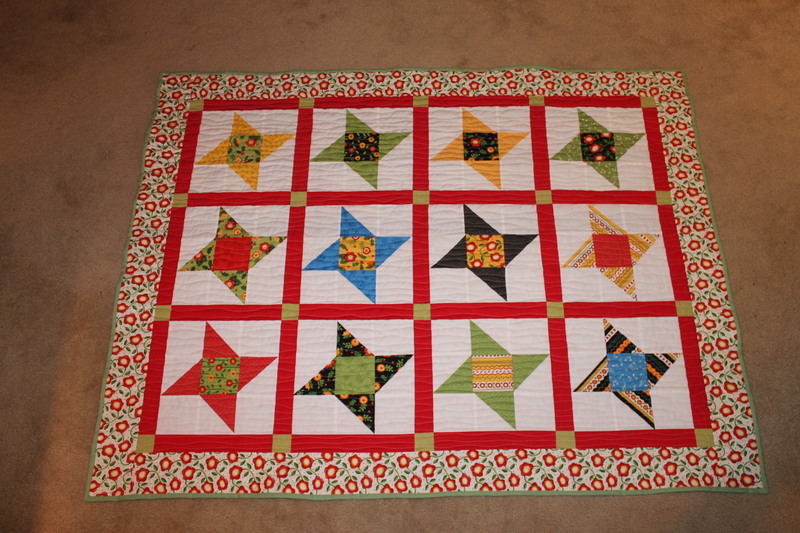 I have enough left for another whole quilt. 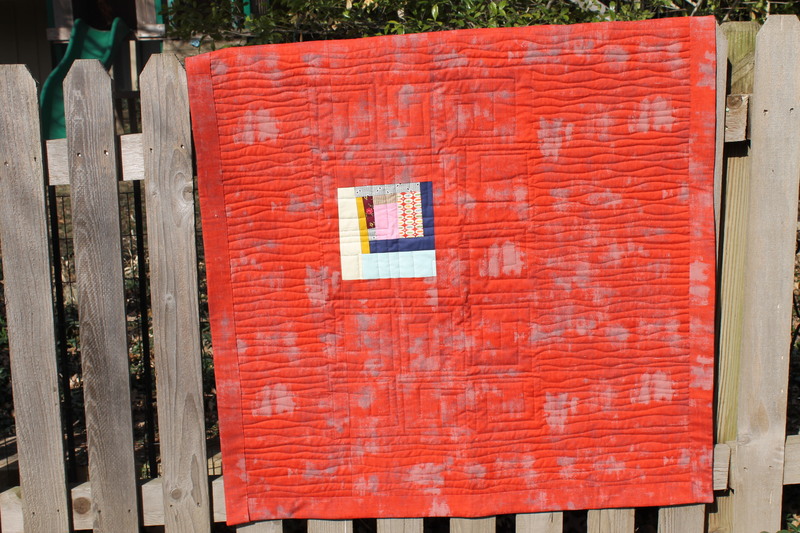 The next one used some batik jelly roll strips. 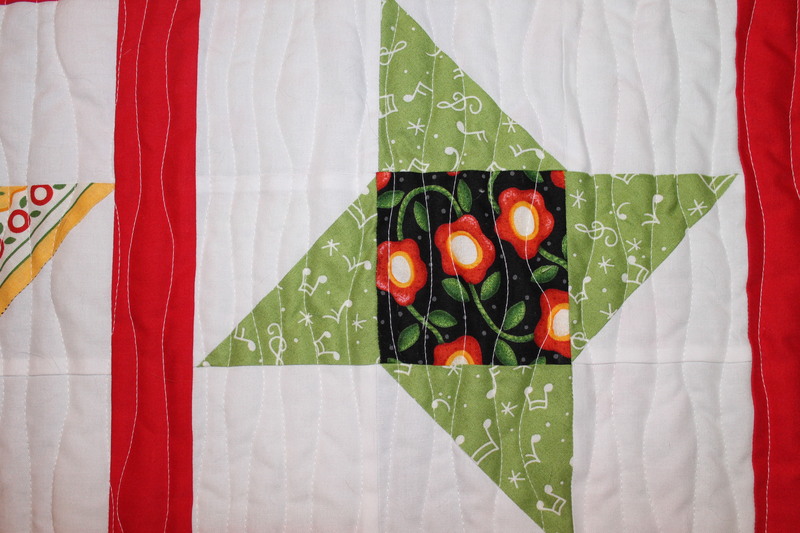 The design is from Quilting Quickly magazine Spring 2013. 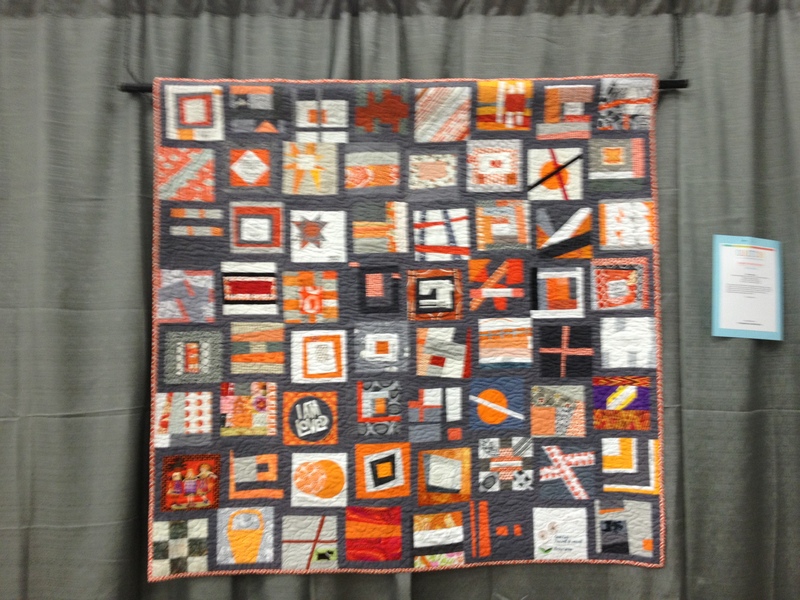 It’s by Jenny Doan of Missouri Star Quilt Company fame. My friends Claudia, Julia, Joyce, and Leslie helped me put the top together. Louie decided he had to get in on the action. The last one I finished this week. 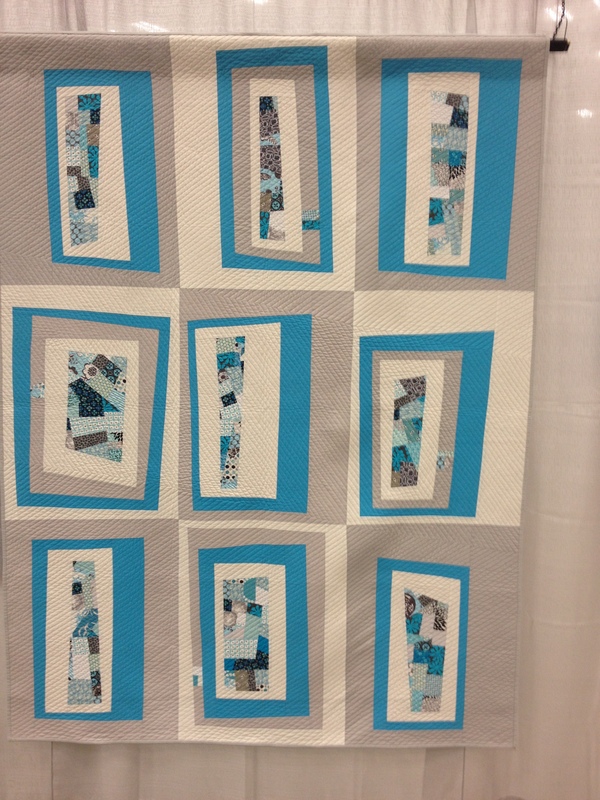 I used a charm pack that I think was from Free Spirit picked up at QuiltCon. 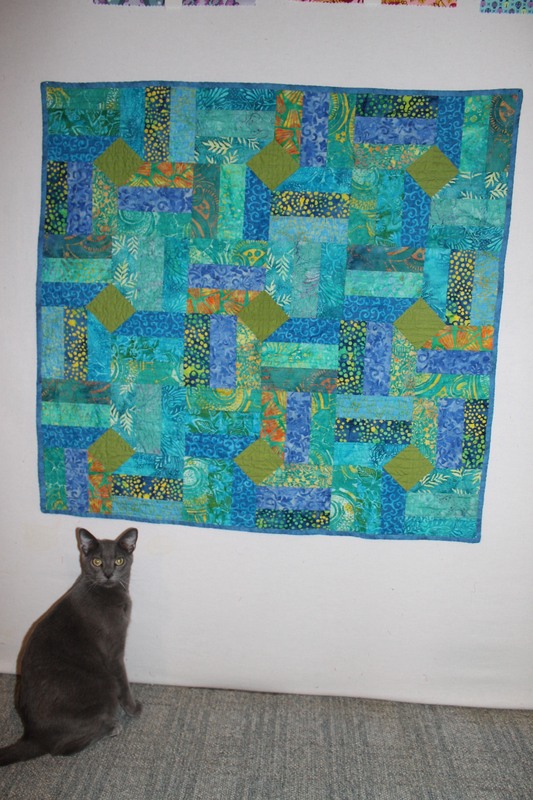 My friends also helped me with this disappearing nine patch top. 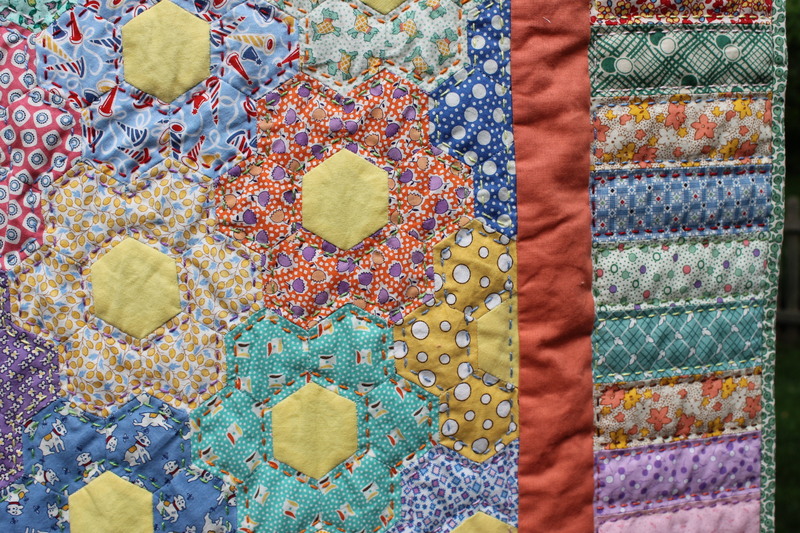 Right now the quilts are just going to one and two year olds. 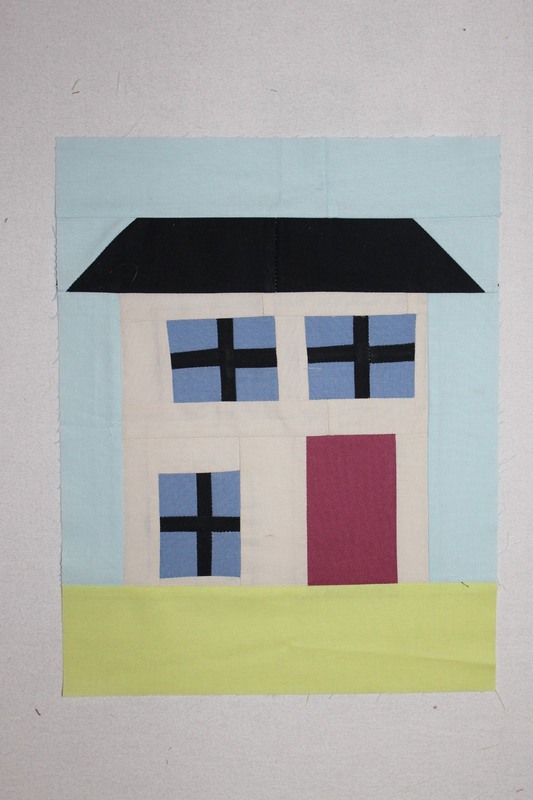 Once BB becomes a sanctioned charity of the KCMQG maybe we’ll be able to provide quilts for all the children. 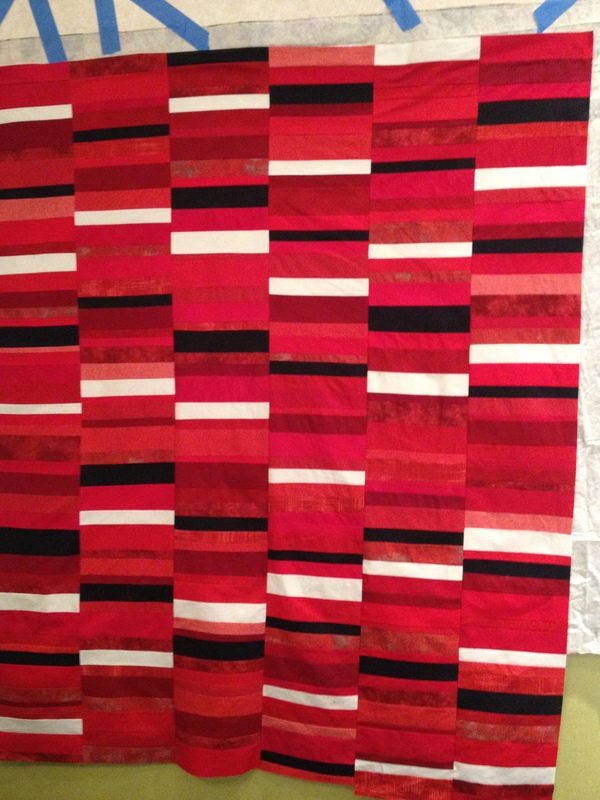 Contact me if you’re interested in donating a quilt! 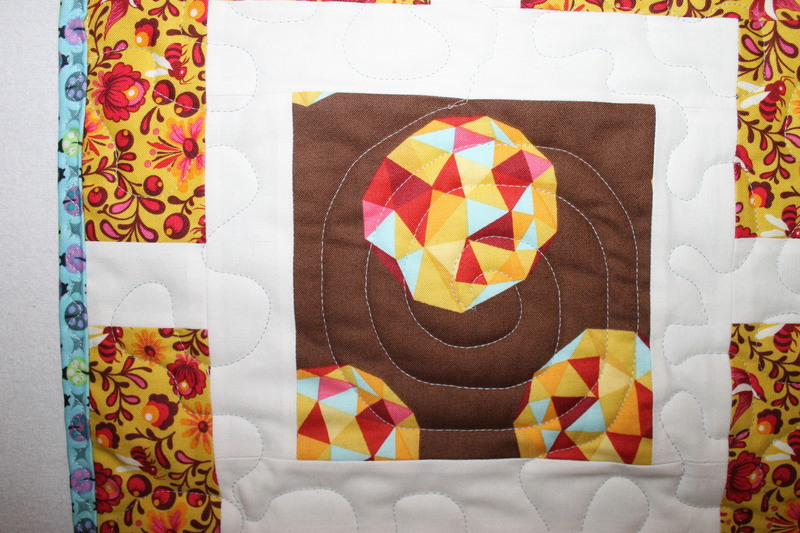 I’m a little behind schedule here posting about the two quilts I finished last month. Since then I’ve been working on some smaller projects that had hard deadlines so I neglected to get this up sooner. 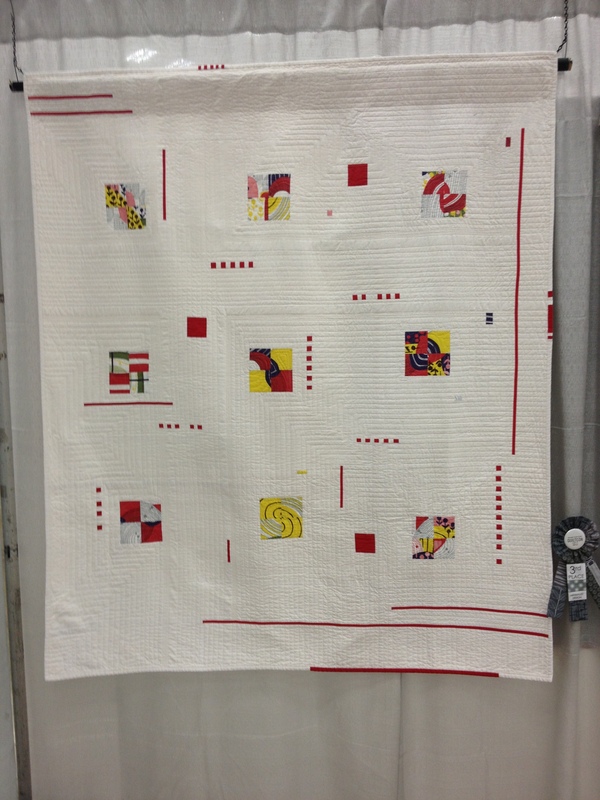 First is my Denyse Schmidt improv quilt. 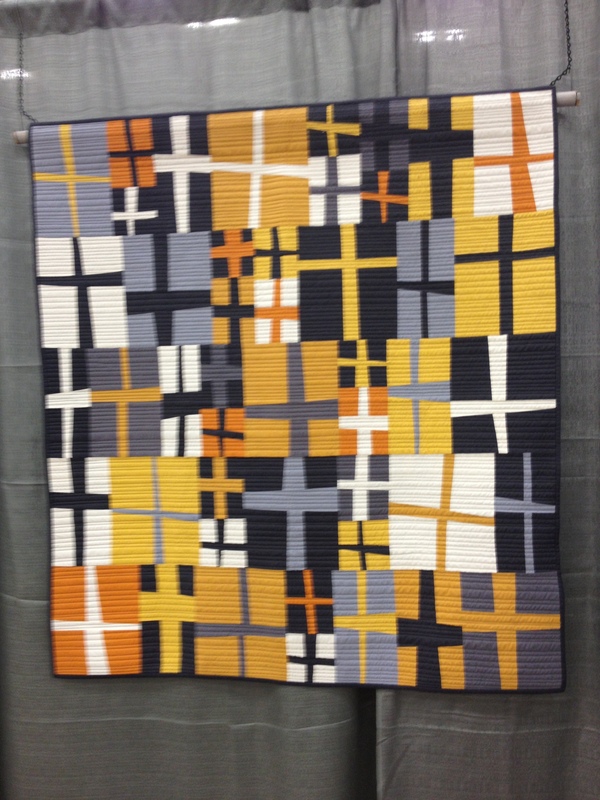 As I mentioned last October, I attended her lecture for the Kansas City Modern Quilt Guild and the follow-up workshop. 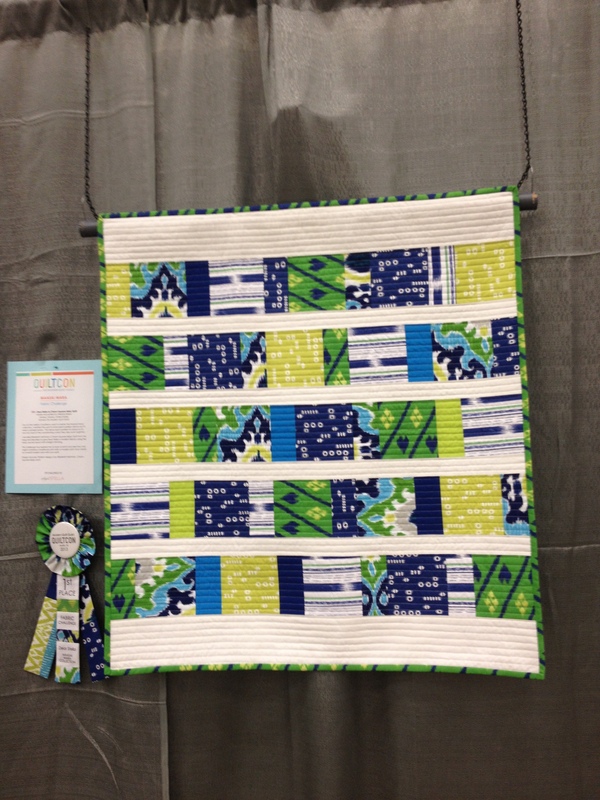 I ended up with seven blocks of various sizes and had no idea what to do with them…..until I saw what Shea had done with hers at one of our meetings. 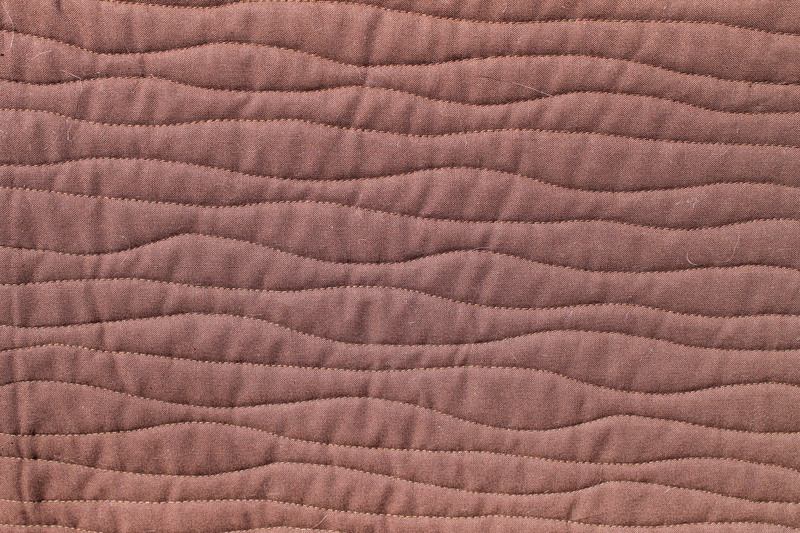 I used chocolate brown Kona instead of Shea’s charcoal gray and I think mine is bigger and more off-center. The back is Moda Grunge, I’m not sure what color. The photo makes it look very orange but it’s much more red. 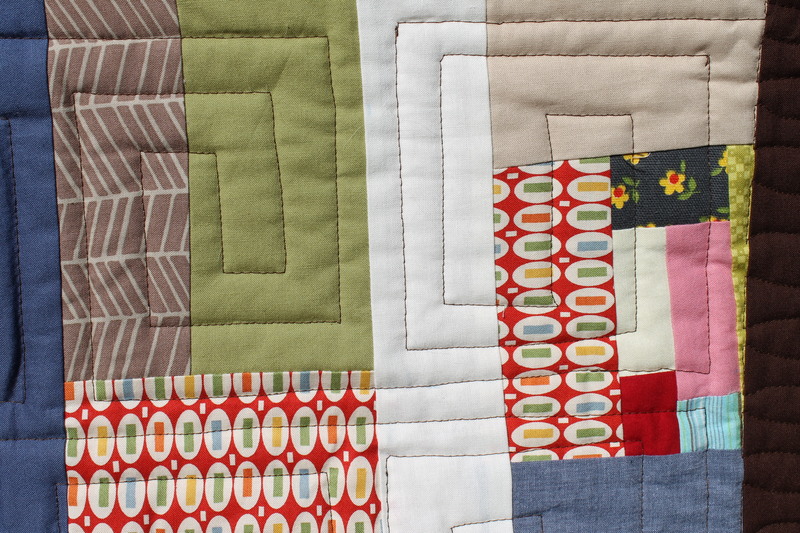 I quilted the blocks with a boxy maze-like pattern and my go-to waves on the borders. 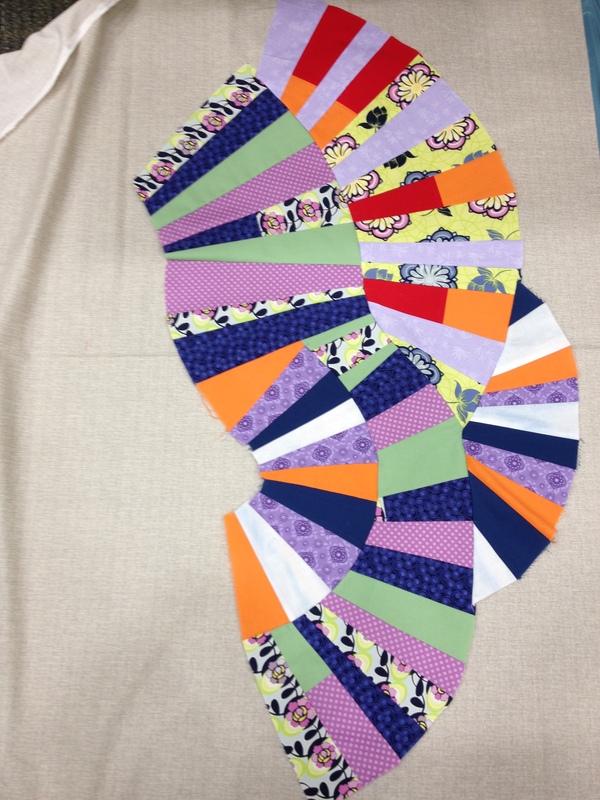 Instead of binding the quilt I used the facing method I learned about from Valori Wells in one of her workshops at QuiltCon. 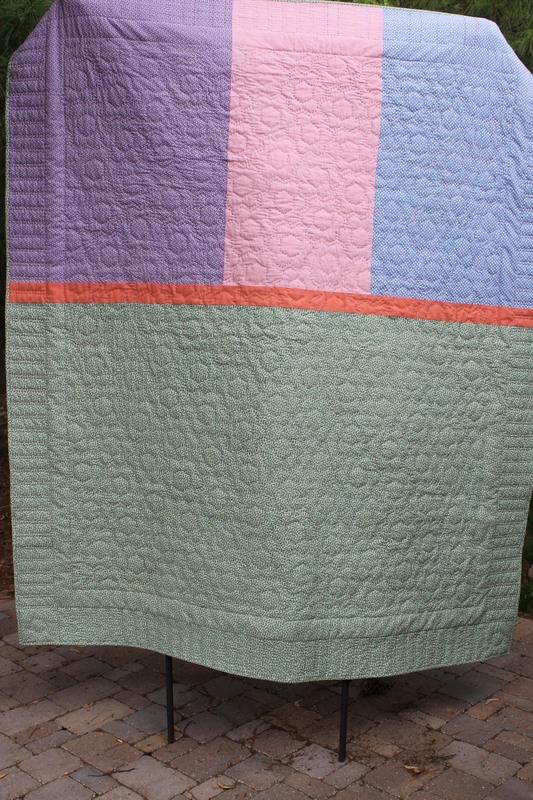 I think it looks good on this type of quilt. The second finish was a long time coming. 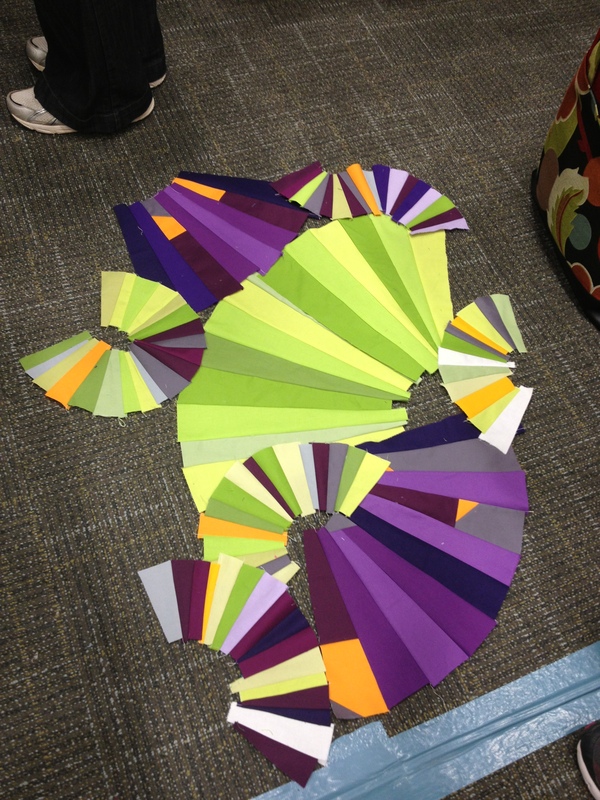 I started the English Paper Piecing probably two years ago. Many hours of guilt-free TV watching ensued. 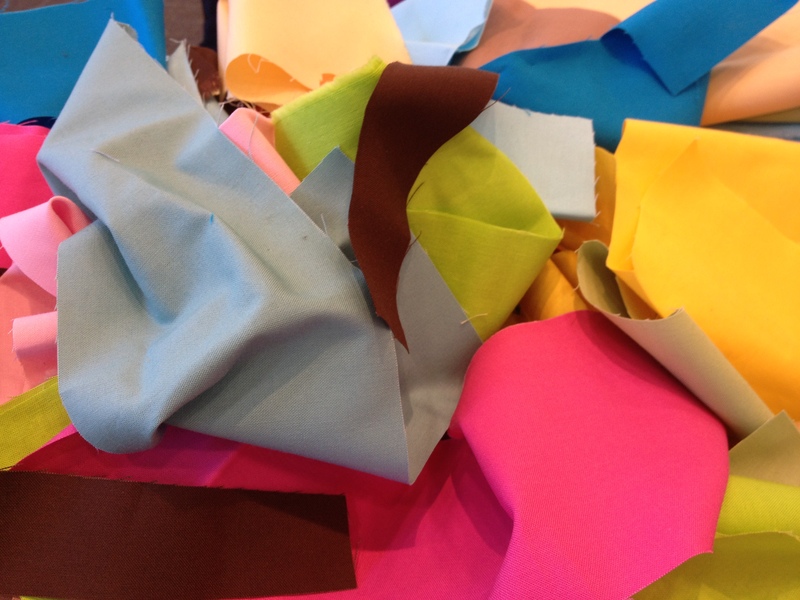 I wanted to use up some of my 30s reproduction scraps but I’m sure I ended up buying more than I saved. I looked all over the internet for a good way to finish this off, without much luck. 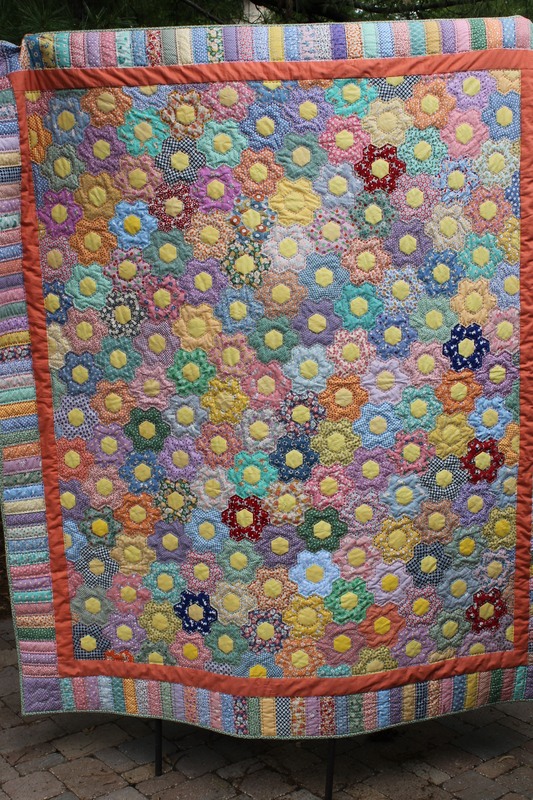 Everything I found had you either appliqueing the flowers onto a really big background or cutting edges off. Neither of those seemed like the best options to me. 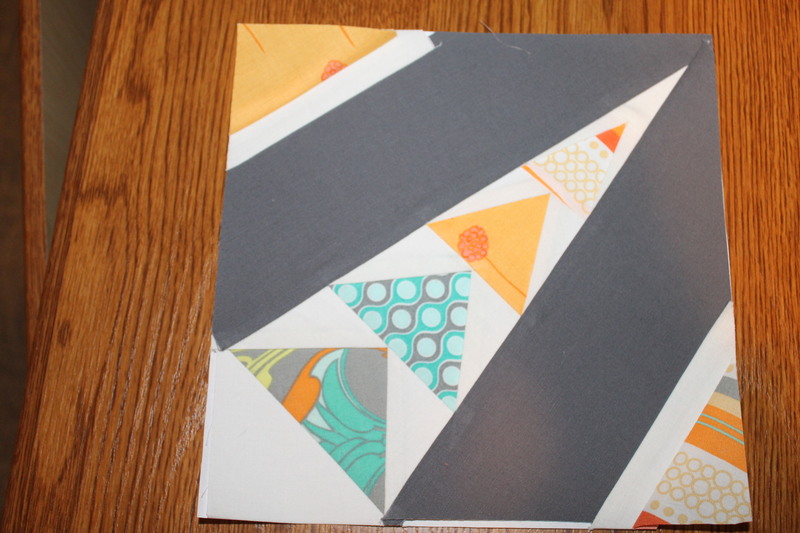 So I cut the foundation paper and pieced those for the edges before applying the border. 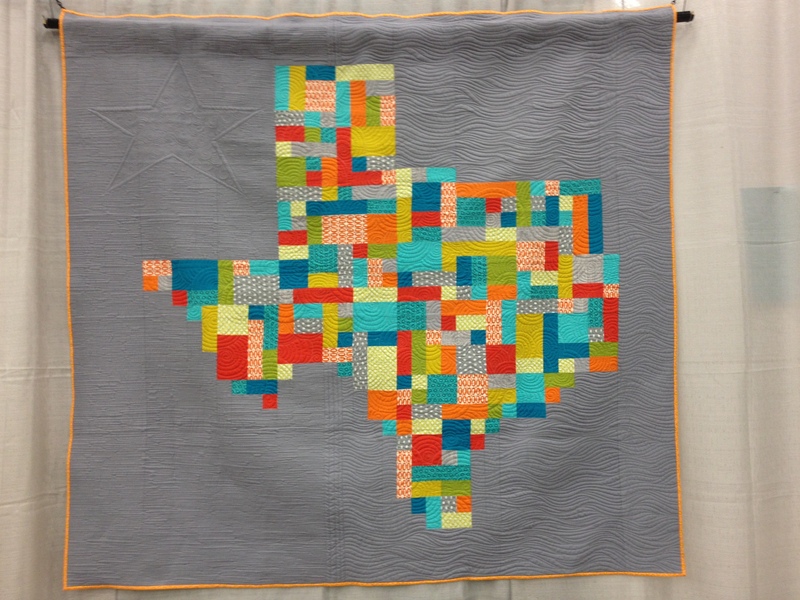 I then decided to big stitch quilt the entire thing. 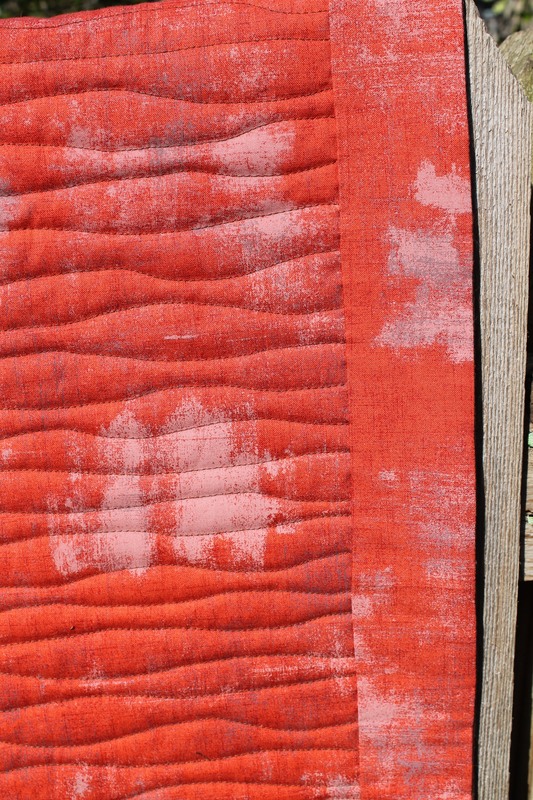 I used a wool batting which made the stitching much smoother. 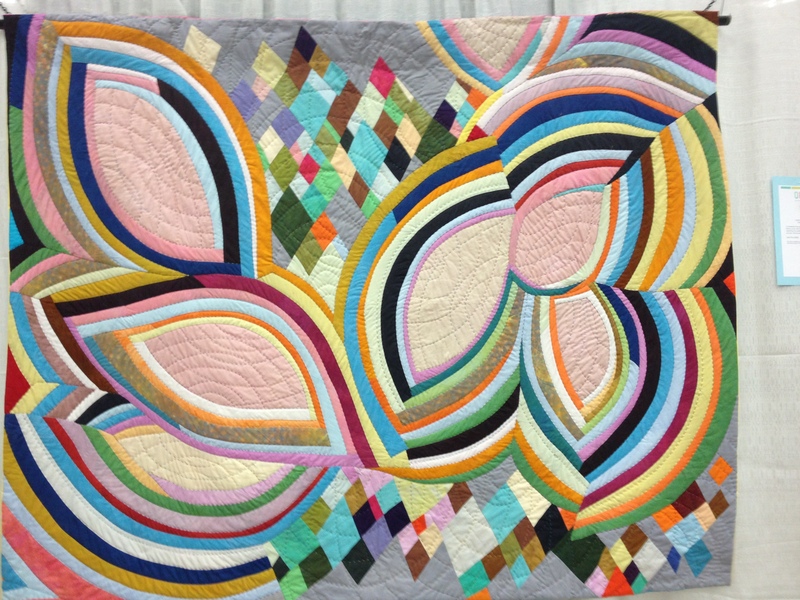 I think I’ll have to keep this quilt after all that work. 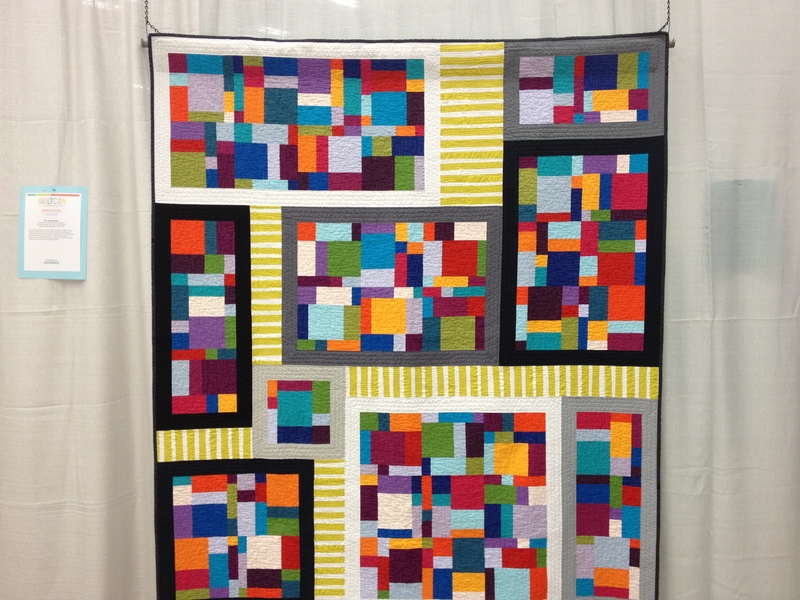 Three weeks ago my local modern quilt guild hosted its second annual weekend retreat “Quilting By the Kaw” in Lawrence, Kansas. 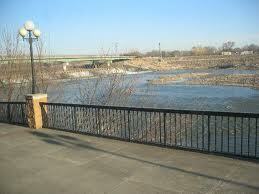 Spring Hill Suites overlooks the Kansas (or Kaw) River, and although it’s not a spectacular view, it is restful and calming. 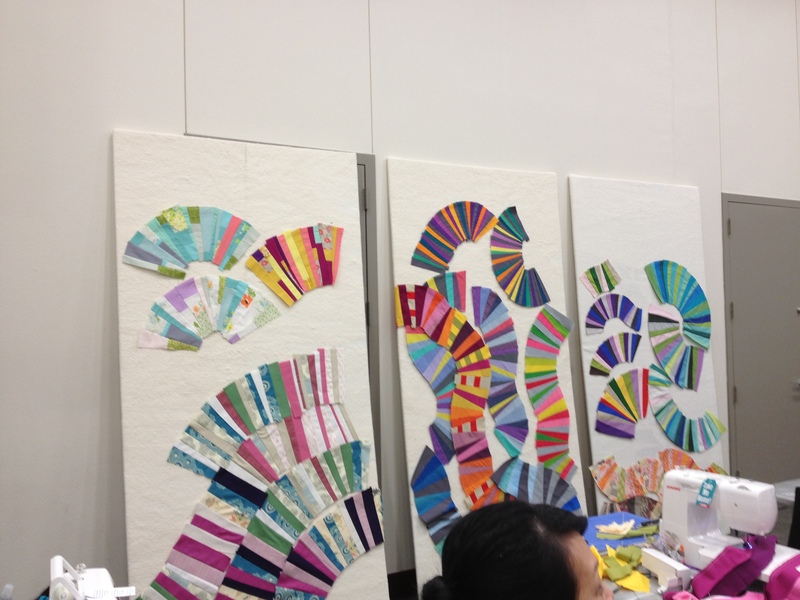 Sewing for two days straight was heavenly! My only breaks were a field trip to Sarah’s Fabrics and watching Wichita State lose to Louisville in basketball on Saturday. 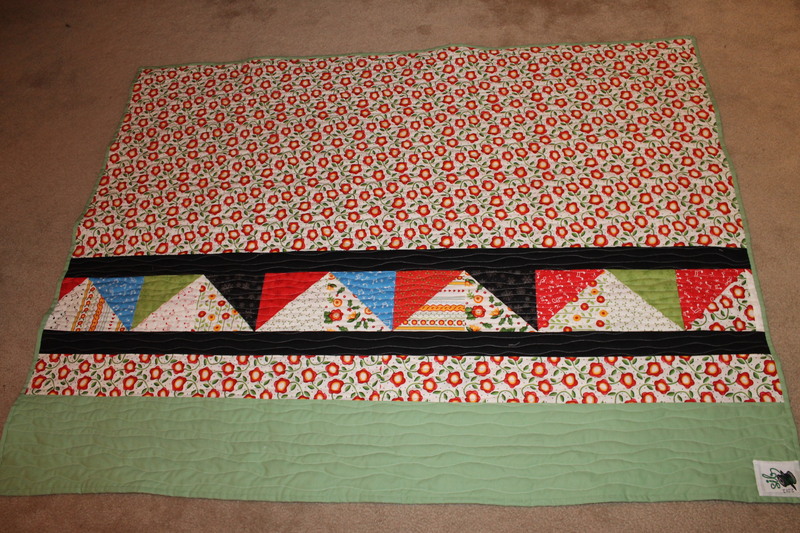 One of my projects was this Bento Box-like quilt top using two long-saved Together layer cakes by Moda. 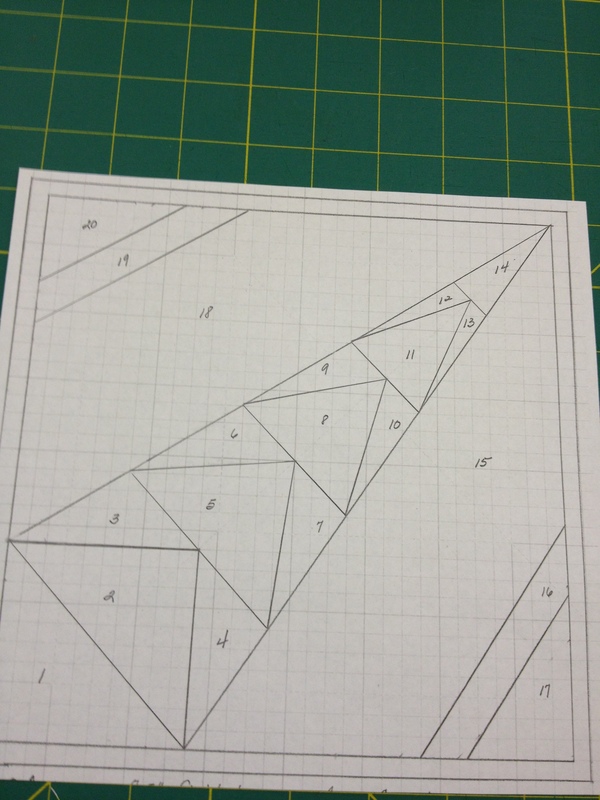 What started out like this….. I scored these as a door prize. It’s nice to see some flowers somewhere! 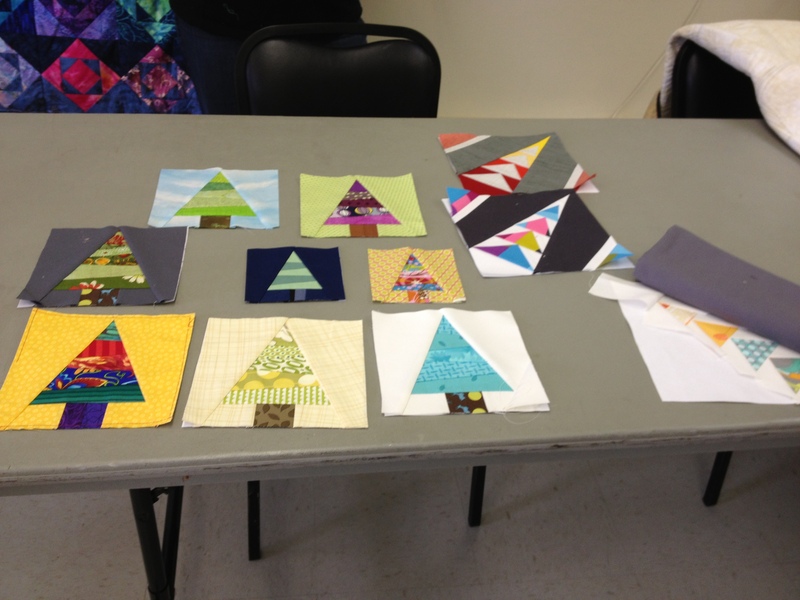 Last weekend I took a paper piecing workshop through the Guild with Julie. I’ve done some PP before, mostly blocks here and there. 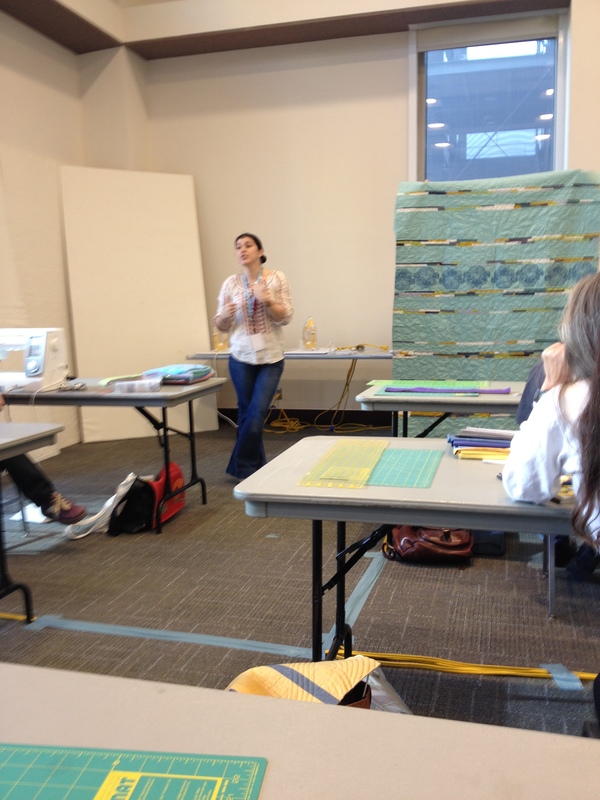 But Julie has some mad skills and I was able to learn a lot in the measly two hours we had. This cute little tree was our warm-up exercise. …..to this in just 20 simple steps! 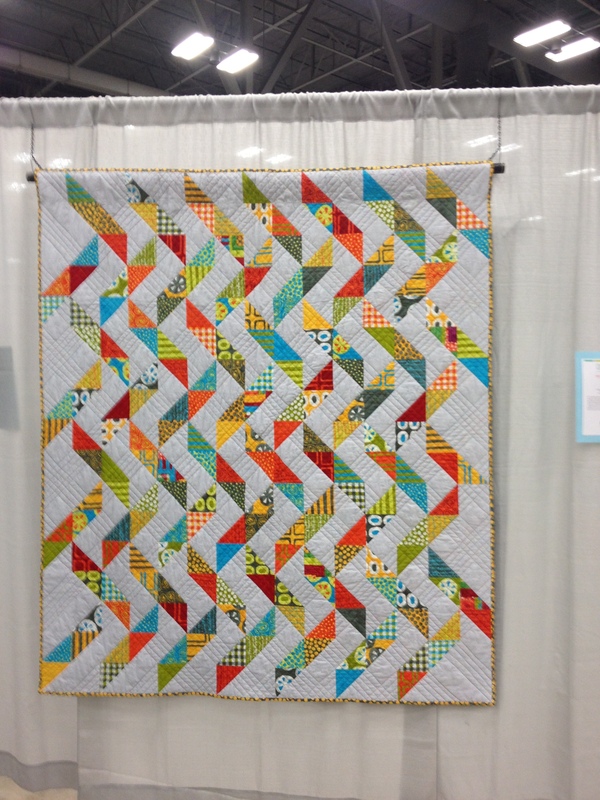 Julie designed this pattern that she calls Geese Crossing. Now I just have three more to do. 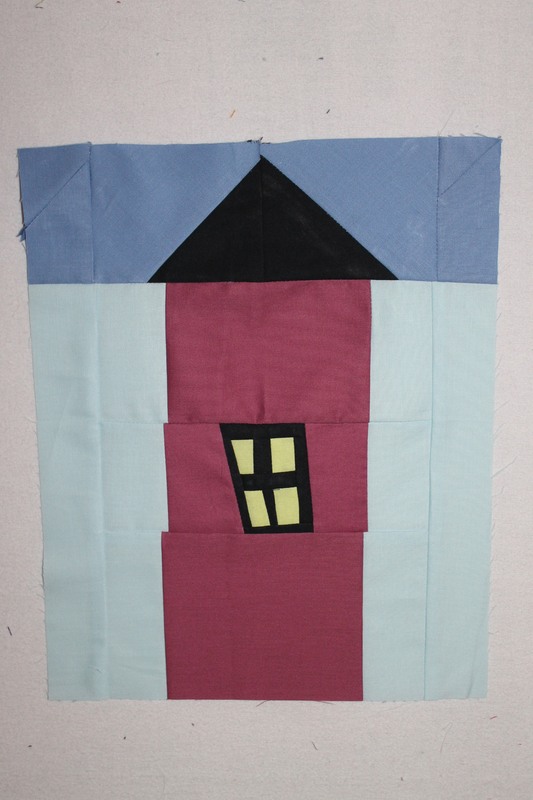 Not sure if this will be a pillow, wall hanging or something else. We had quite a variety of trees and geese at the end. What a fun way to spend a Saturday morning! 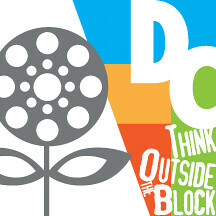 As I wrote back in January, it was my month for Design Camp, an improvisational Flickr bee. 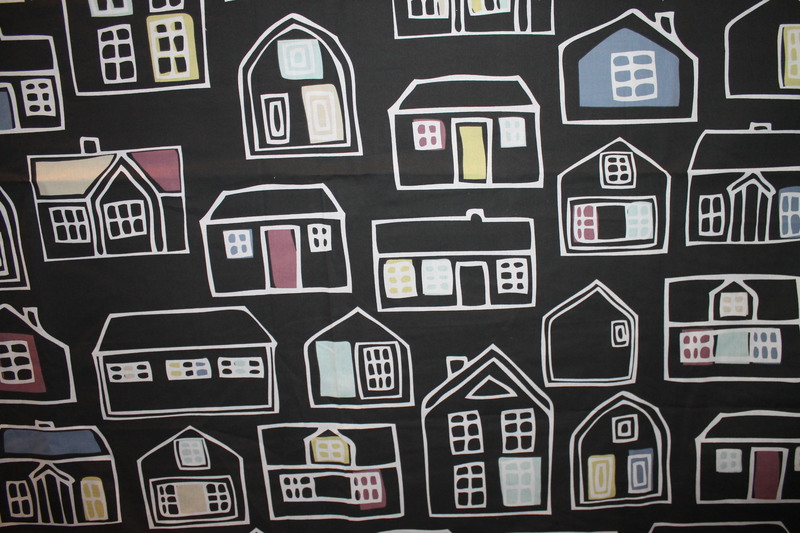 My idea was based on this fabric my daughter bought for me from Ikea. 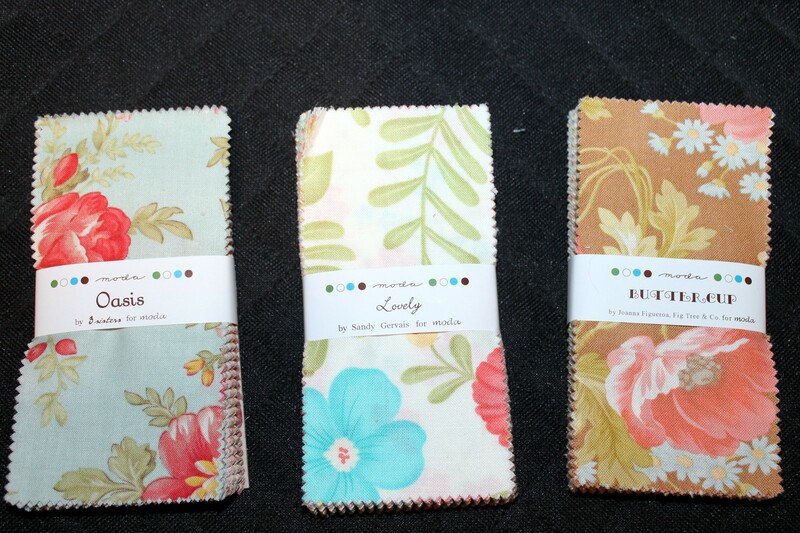 I sent out Kona solids to my bee mates in baby blue, plum, spearmint, oyster, pepper, and denim. The first block I received was from Sew in Love With the Boy. 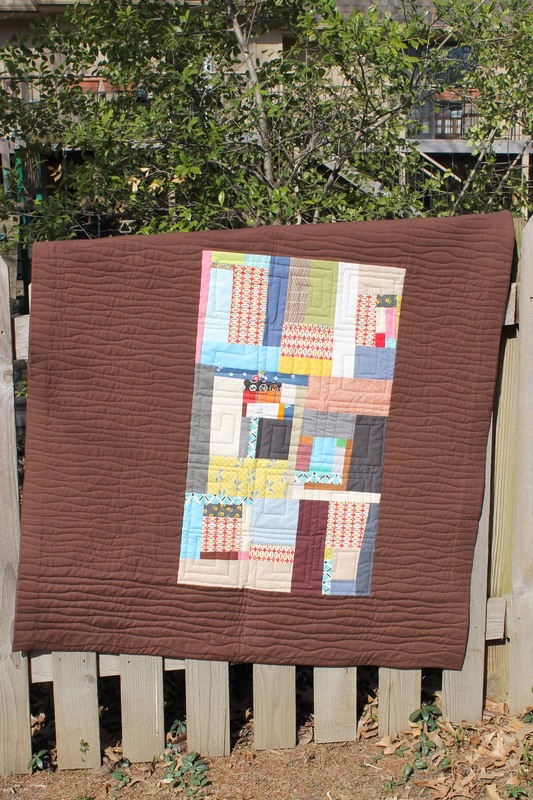 I’m sew in love with the block! 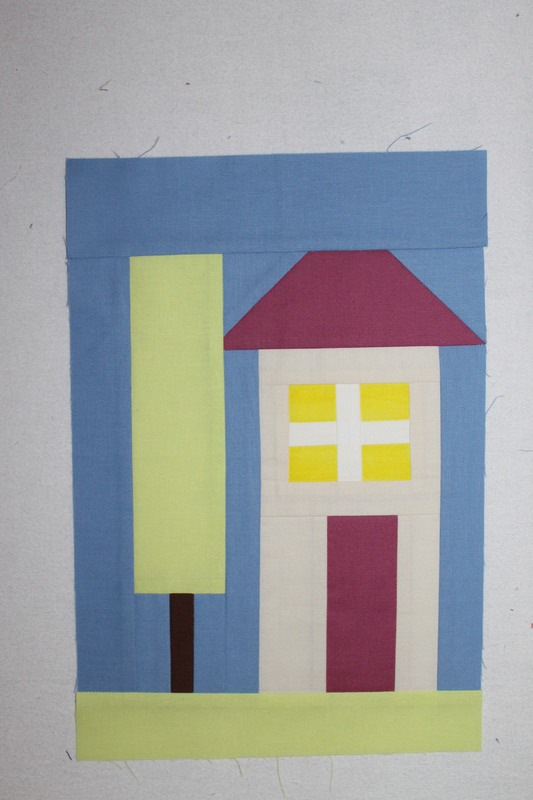 Next came this darling house from A Little Taste of Sunshine complete with a picket fence! 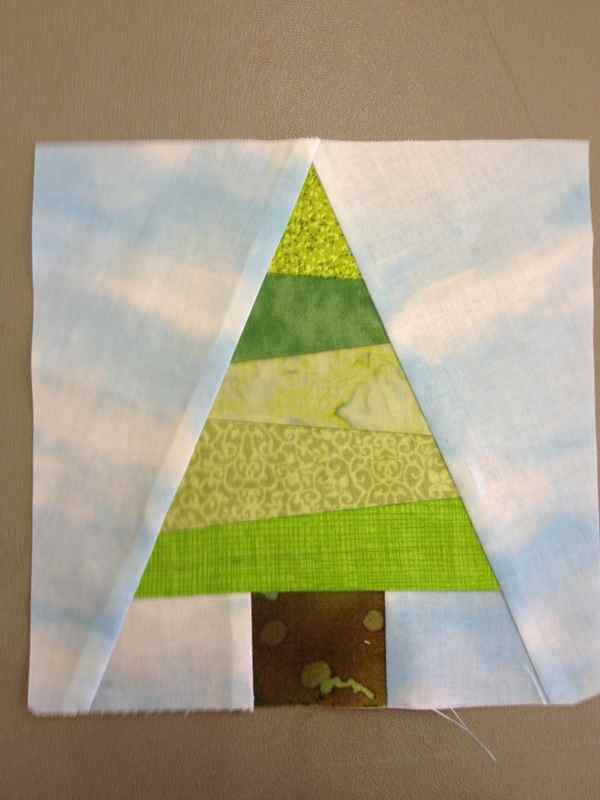 Then this modern one with a tree from Lynds0517. Aren’t they cute! 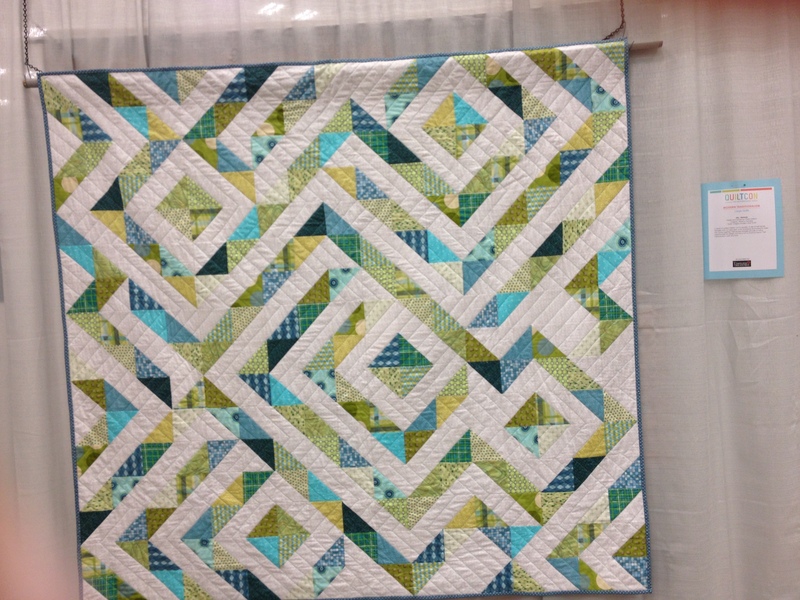 Then this darling ranch style arrived from Design Camp. Dorrylu’s house with tree came a couple of days later. The last one I received so far is from Birdydanana. So cute! And methinks a lot of work. 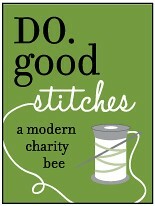 I know a few bee mates are running behind so I still have a couple of blocks to come in. Can’t wait to start putting these beauties together. 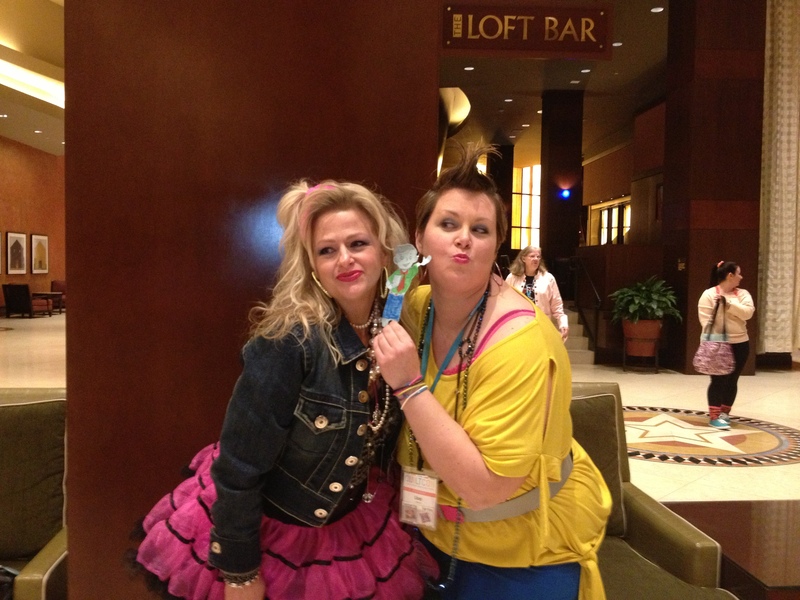 The 80s party on the Friday night of QuiltCon was a lot of fun! I think those who had the best time were not even born yet. The girls from Marmalade Fabrics, Tammy and Lisa, were dressed for the occassion. This after a very full day cutting and selling their awesome wares. 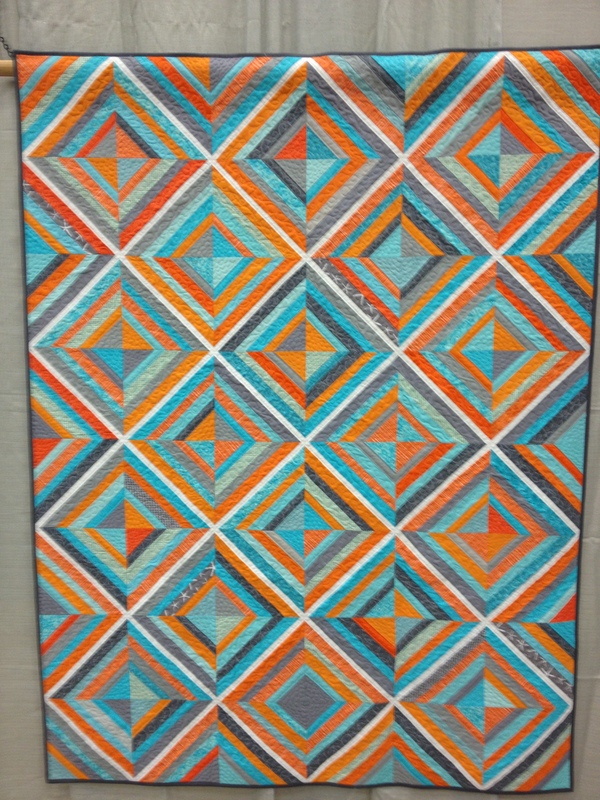 There were so many amazing quilts in the show. Judging must have been tough. 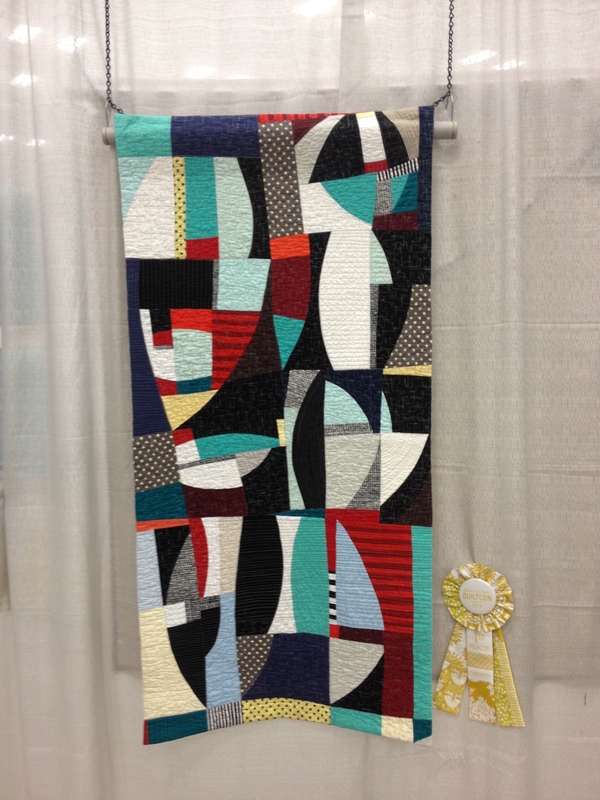 I can’t believe I didn’t take a picture of the Best In Show quilt but you can see it here. (Thank you, Hollie!) I also neglected to take good notes so I apologize for not giving credit for a couple but here are a few of my favorites. 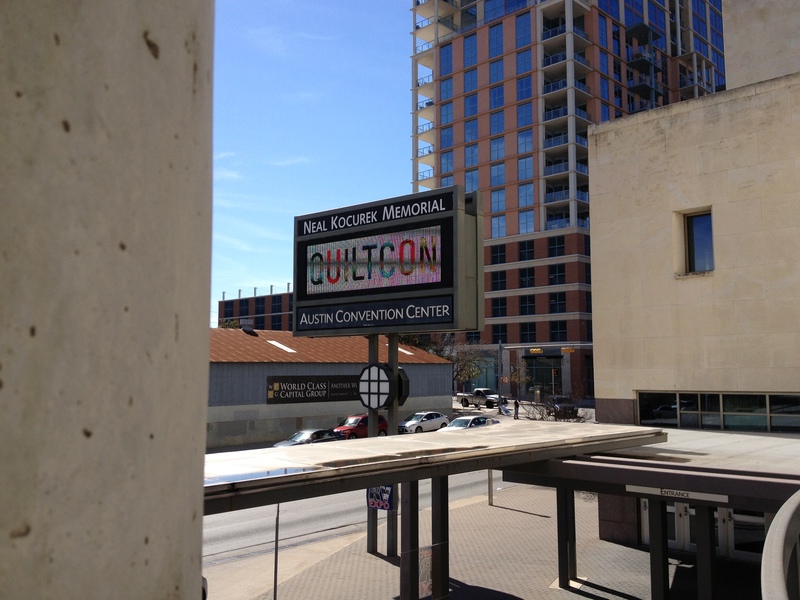 It’s been a whole week since I arrived back from Austin. I spent this weekend with daughter #2 for Mom’s Weekend so I still feel like I’m in a haze. 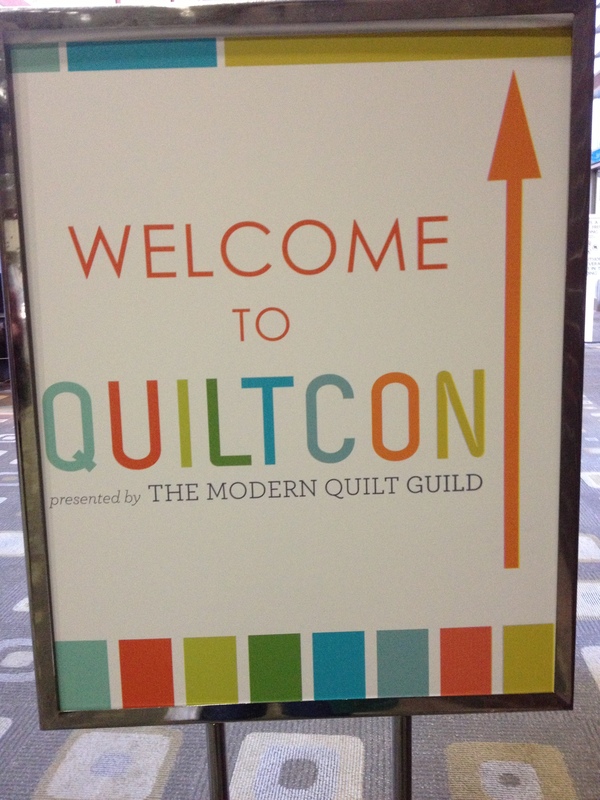 But QuiltCon was everything I hoped it would be and more. 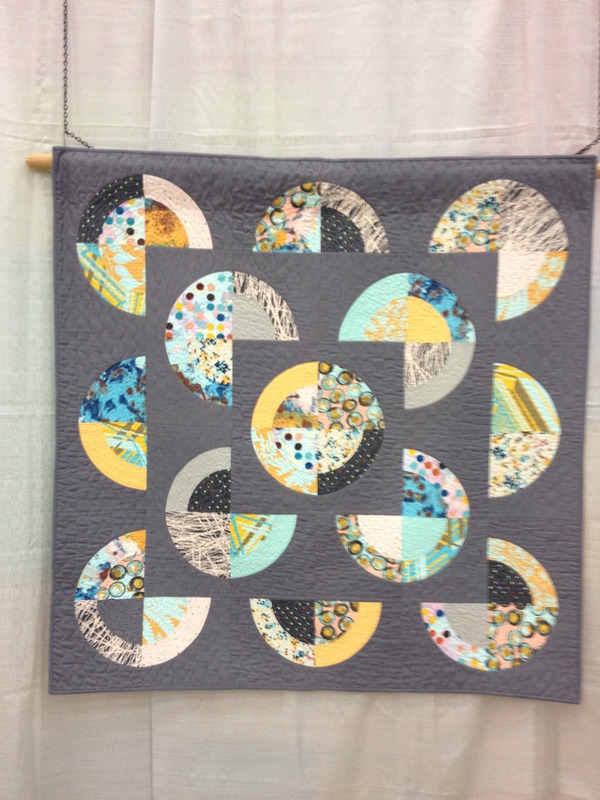 The first workshop I took was “Get Your Curve On” with Sherri Lynn Woods. It was very challenging and should easily have filled two days instead of six hours. I’m always surprised to see so much variety in design even when given the same instructions. I’m not sure where this one of mine will end up but it was fun, and did I mention CHALLENGING? 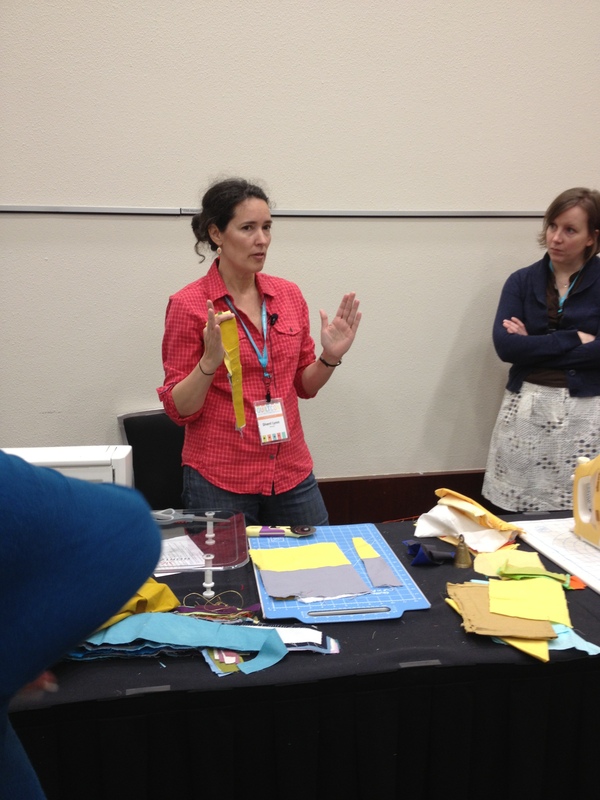 My second workshop was with Valori Wells. 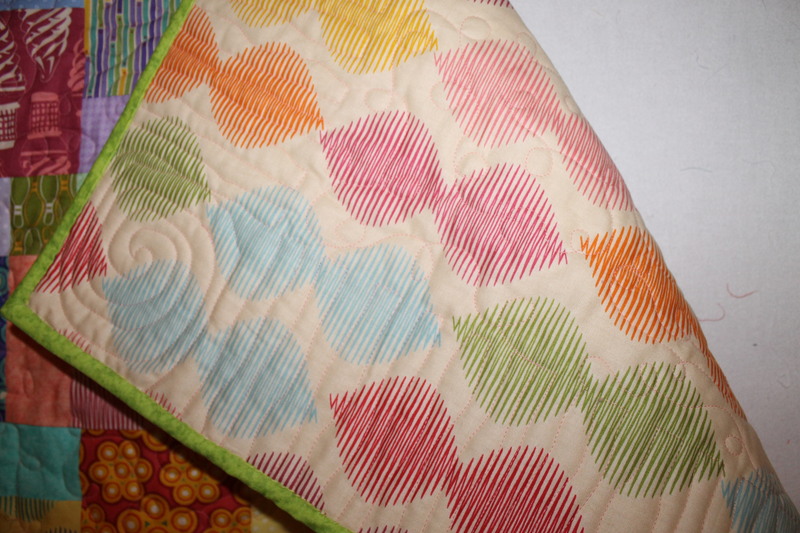 “Signature Quilts” was more relaxing. Just wish I had more to show for the time spent. 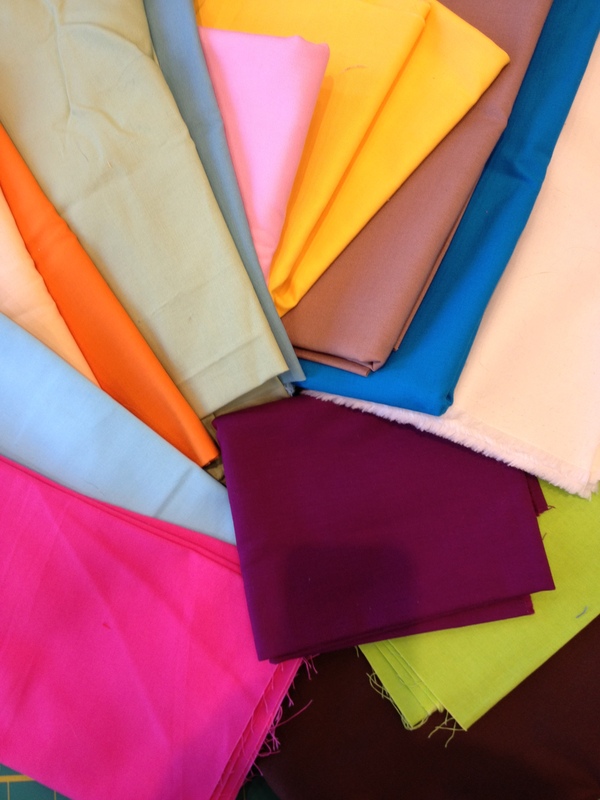 These are the fabrics I chose for my project. 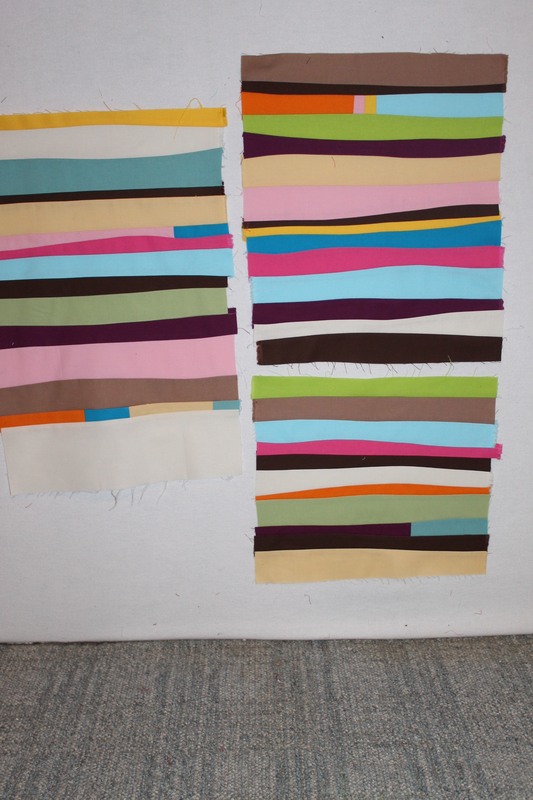 The fabrics cut into 4″ strips. I love the wonkiness of these panels, and the colors work well together. 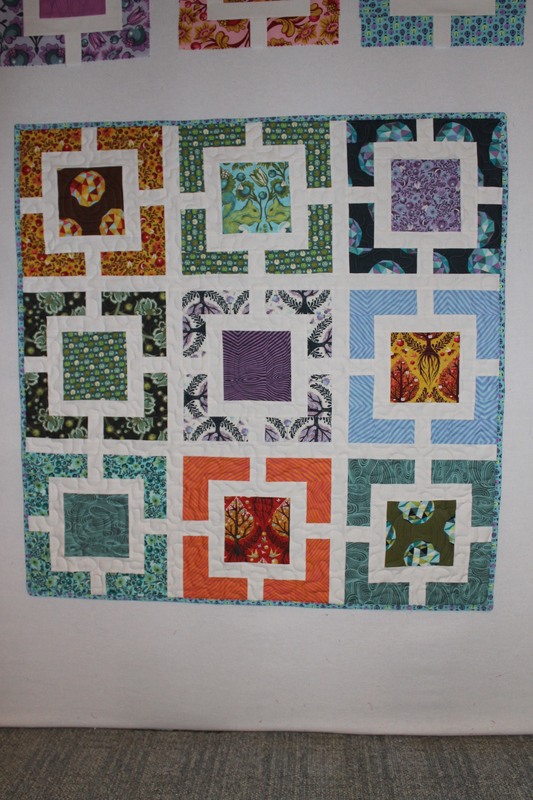 These blocks look big but they are only about 14 inches wide. 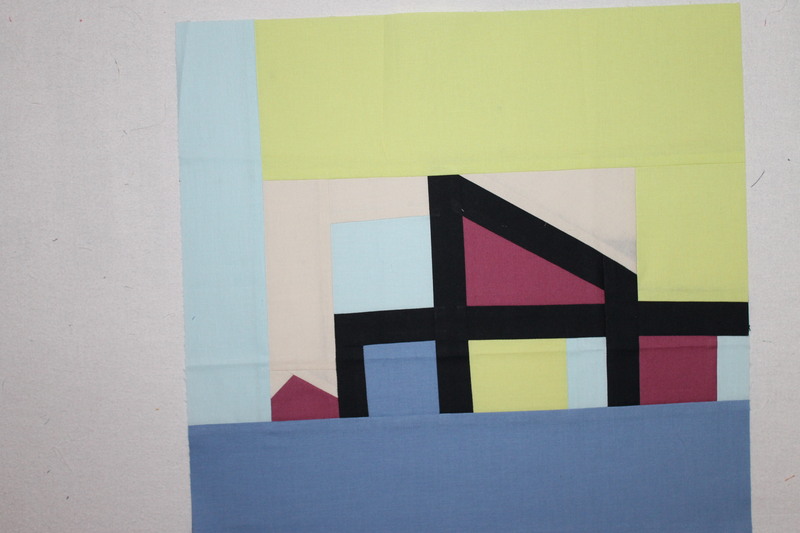 I’ll be finishing this quilt soon, I hope. 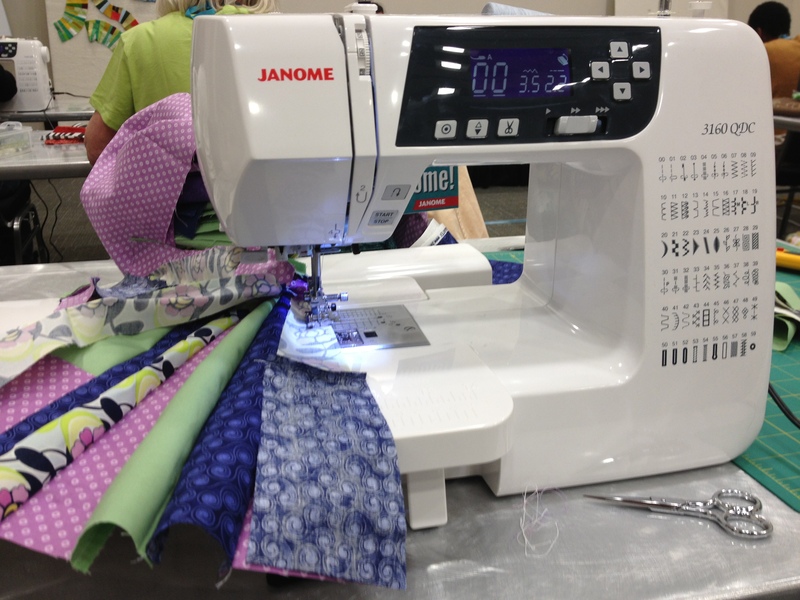 We were able to use these cute Janome machines in the Curves class. 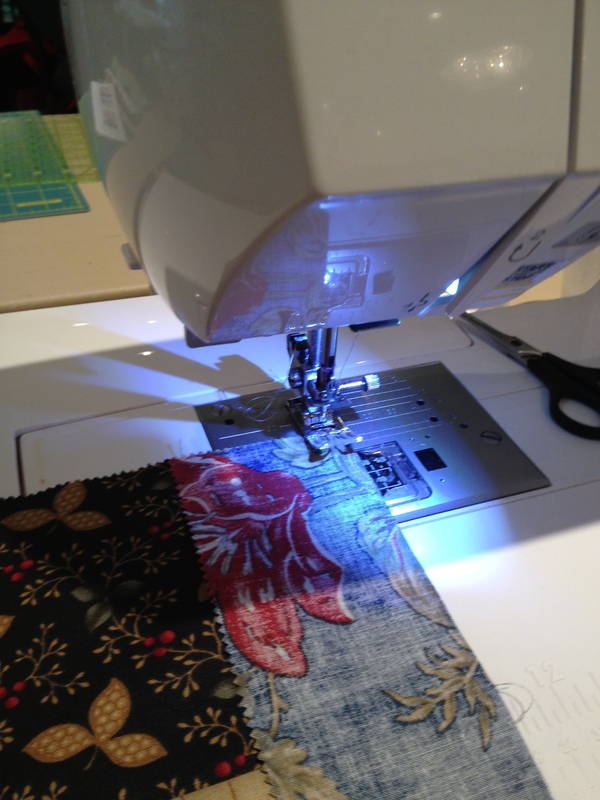 I’ve been sewing on my Bernina so long I thought I would have a hard time adjusting to a different and newer machine. When I found out the local shop was offering an amazing deal on the classroom machines I thought long and hard. I certainly don’t NEED one, even a small one that would be great to tote around to retreats and sew-in days. But I couldn’t pass it up. Included were an extension table, five or six feet, several bobbins AND no sales tax and free shipping. She came while I was out of town this weekend so I can’t wait to play around with her again. 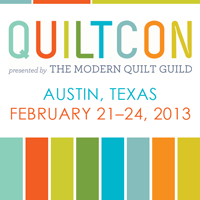 I’ll post about some of my favorite QuiltCon show quilts in the next day or two. Before Christmas this year I vowed to find a way to use it. 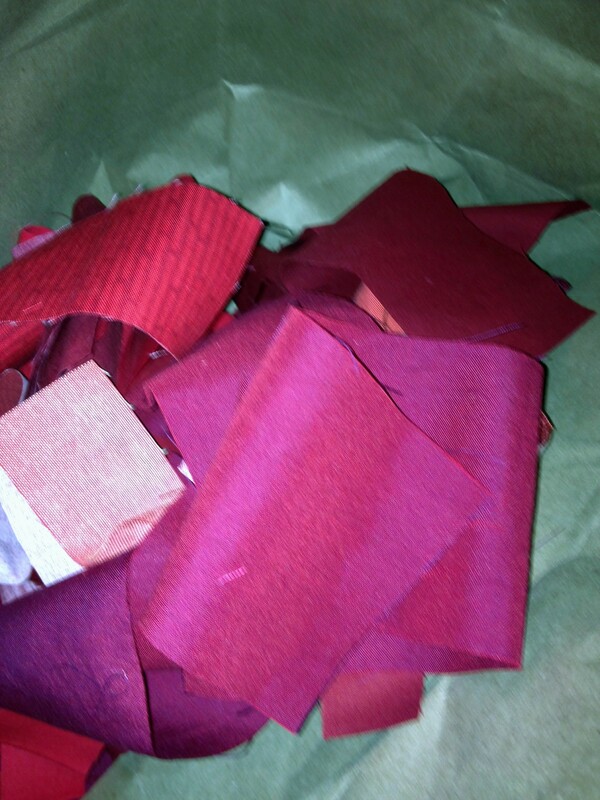 The line is called “The Caroler” and nearly impossible to find now so I needed to use just what I had. 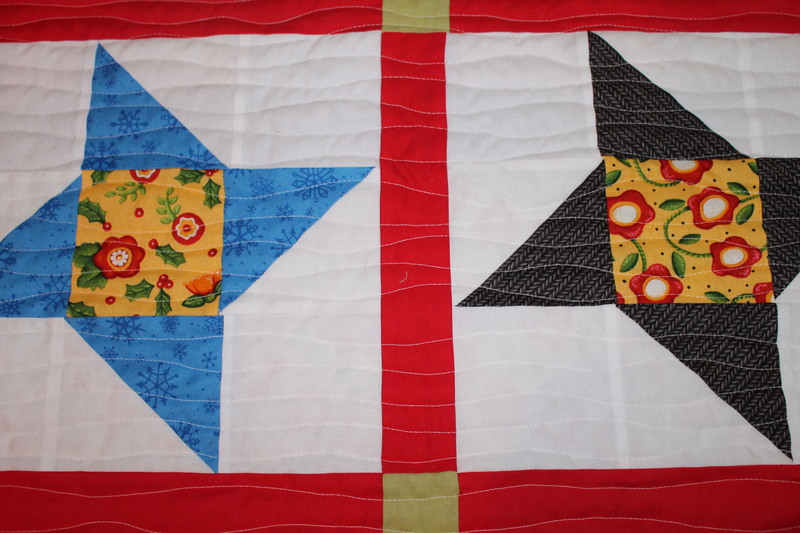 Perusing some books I came across the friendship star block and it seemed to be the perfect solution. 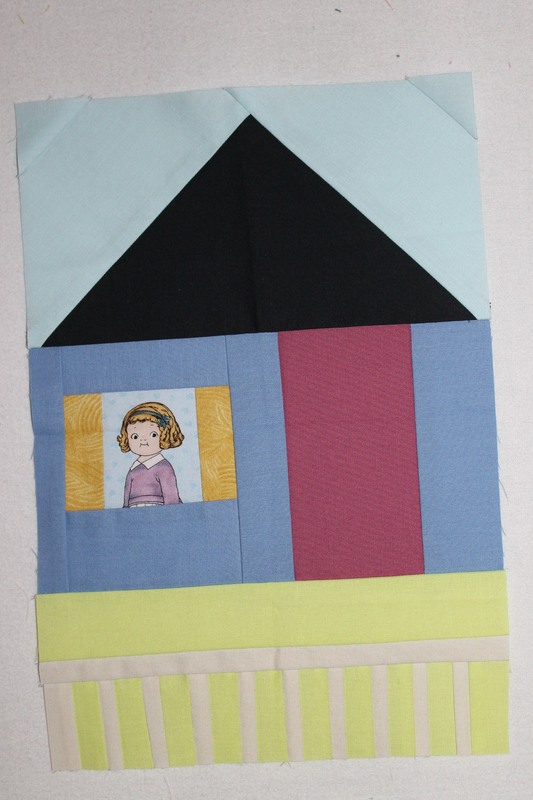 As I started cutting and sewing the blocks I kept thinking of my friend Kathy. We started as neighbors more than fifteen years ago and have stayed in touch through her three moves, divorce, and death of her mother. She’s been there for me through some rough patches, as well. I’m happy she’s back in town and we can talk on the phone even if we don’t get together often. 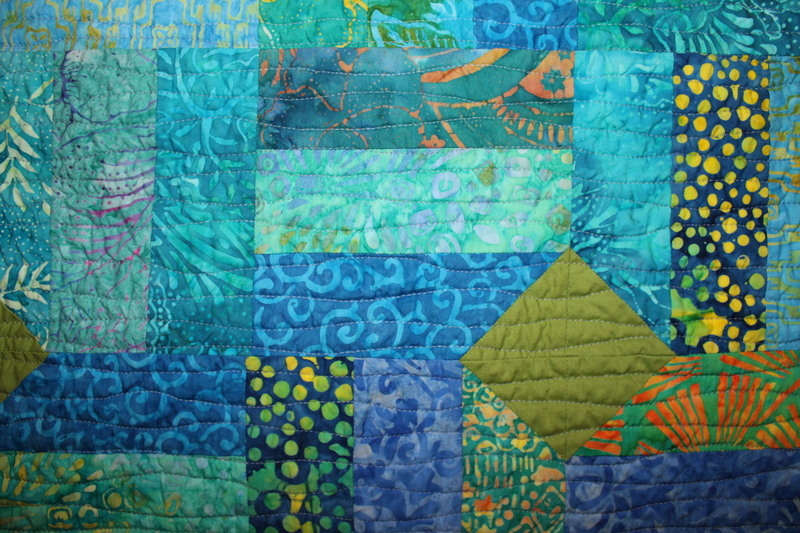 Anyway, Kathy is an art lover and I knew she’d appreciate these bright colors. 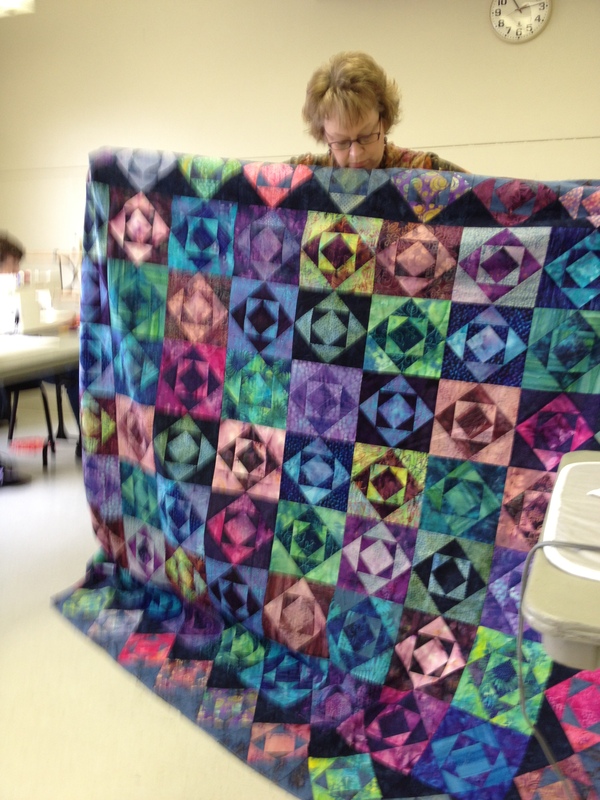 So even though I thought originally I would keep this quilt, I soon knew I had to give it to her. 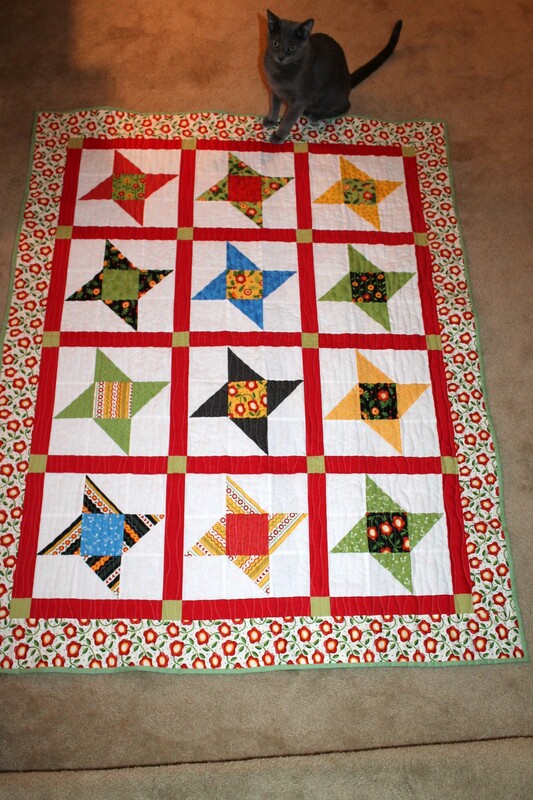 Unfortunately I didn’t finish it in time for Christmas but I did give it to her two weeks ago. I know she was surprised and I think she really likes it. 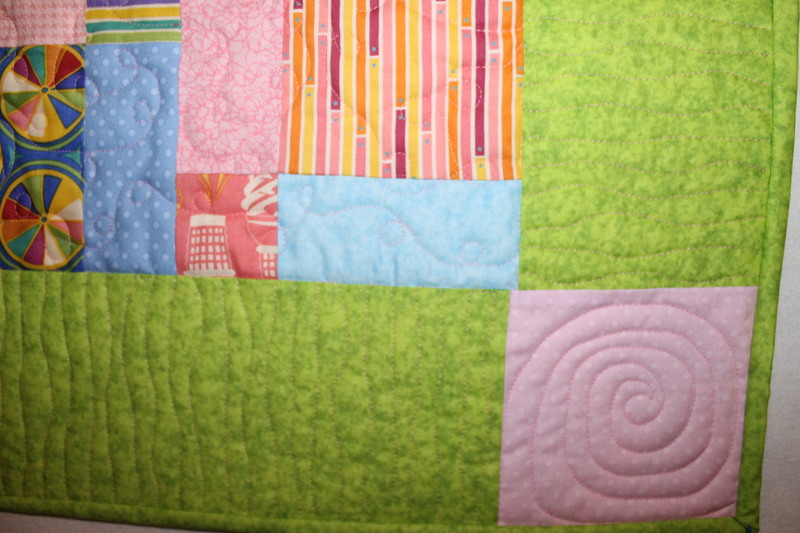 At first I wanted to try something new with the quilting by breaking the blocks down and mixing some different patterns in. But that would have taken me much longer than I’d wanted so I fell back on my tried and true wavy lines. 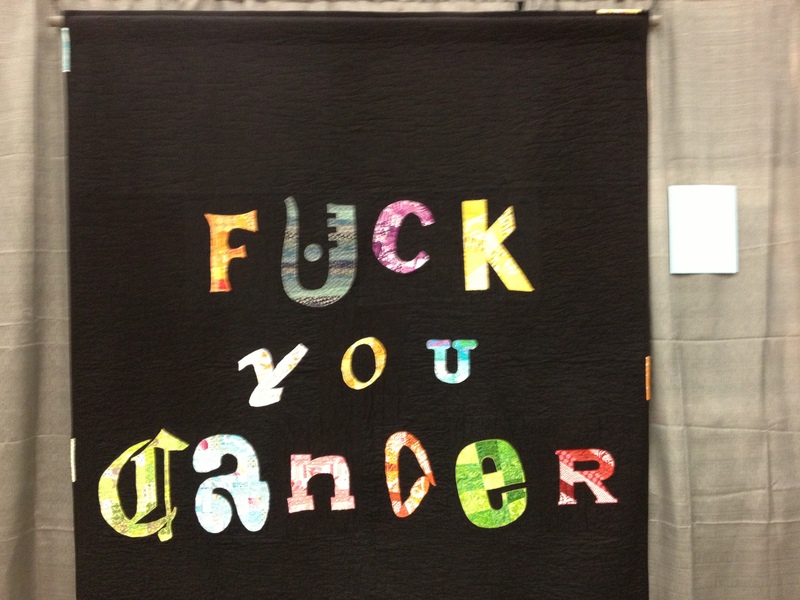 I’m so happy this quilt has a good home and will be well taken care of.